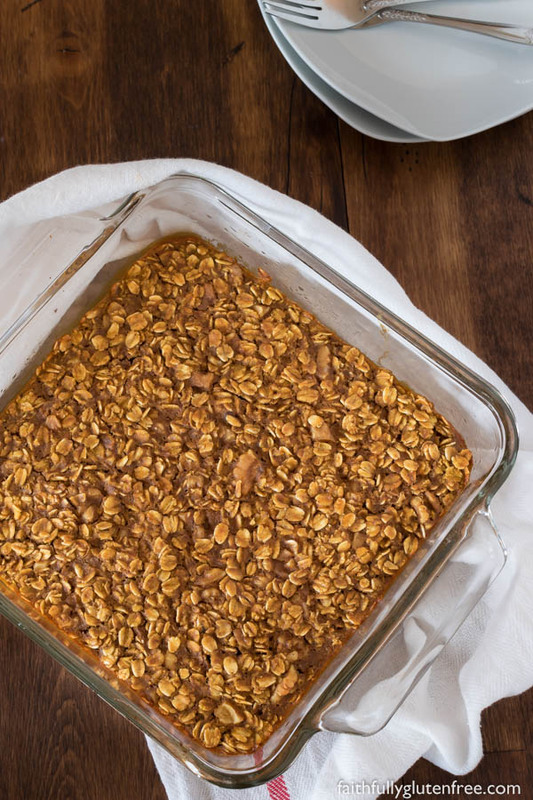 Healthy Baked Pumpkin Oatmeal is the perfect make-ahead breakfast. It’s so tasty, you could even have it for dessert! 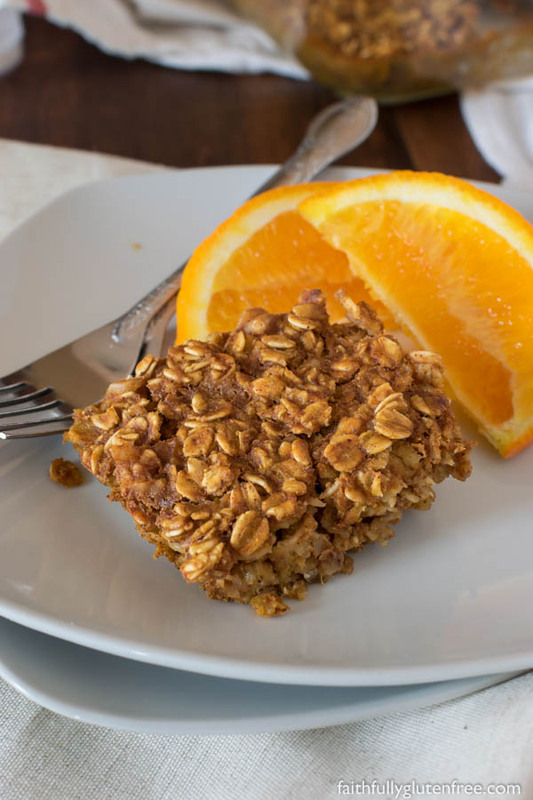 This healthy baked Pumpkin Oatmeal was actually a whole family pleaser, with the kids actually bargaining (we try to do that instead of arguing) over who was going to have the last piece for breakfast the next day. 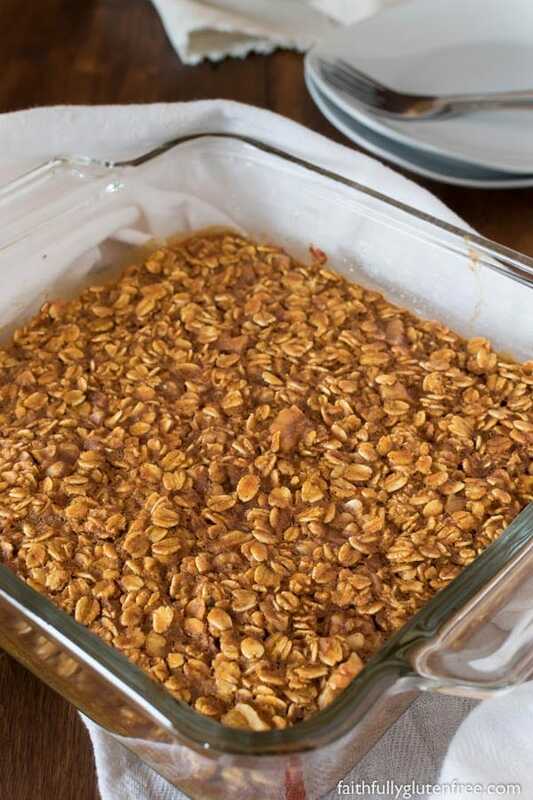 We like to bake our oatmeal ahead of time, and re-heat it in the morning, but you can also mix it up the day before and just popped in the oven in the morning. 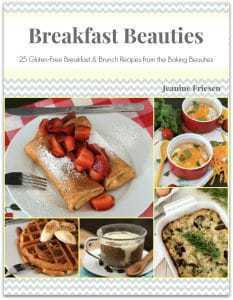 Either way you will have a nice warm, hearty and healthy breakfast. This baked Pumpkin Oatmeal is sweetened with natural maple syrup, and contains no oils or butter. The pumpkin puree is enough to add the moisture you need. Feel free to omit the pecans or walnuts if you want it to be nut free. You can make the recipe your own – Try adding dried cranberries or sunflower seeds to change things up a bit. Side Note: Now, I know, not all of you can eat oats, even if they are gluten free. However, a number of us can tolerate them without any problems. Just make sure your oats are labeled “Gluten Free” on the package. If you’re unsure, please talk to your doctor about it. 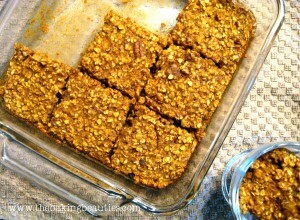 This Healthy Baked Pumpkin Oatmeal is perfect for breakfast or brunch. Make a pan on the weekend, and simply reheat in the microwave on busy weekday mornings. Lightly grease an 8x8-inch square baking pan. Set aside. In a large bowl, whisk together all the wet ingredients. Pour into the lightly greased baking sheet and bake in preheated oven for 30-35 minutes. Let sit for 5 minutes before serving. This would be great topped with some ice cream or whipped cream too. That looks and sounds amazing! I have a serious love affair with pumpkin. What can I bargain for a piece of this delightful pumpkin crunch oatmeal?? Yum! Saving this for next time my g-son is here, he is a serious pumpkin addict! Looks delish. could this be soaked at all? I'm trying to do more soaking and sprouting with my grains. I don't see how it would work but I thought I'd ask. Thank. Made this this morning. Put it together yesterday and put it in the fridge so it would be ready to go in the morning. Perfect! 4 out of 5 people in our family enjoyed this, the youngest being the exception. We ended up using maple syrup on the side, too. It reminds me of French toast. I really liked it because 1- no oil or butter 2- pumpkin 3- whole grain 4- pure maple syrup 5- can be done ahead of time 6- I think this would be very portable and something I could make ahead of time and have on hand. Thanks for a great recipe! Makes me think applesauce or mashed banana would work, too. @GF Gidget I LOVE anything pumpkin as well…pumpkin + spices= DELICIOUS! @Stacy D. Sorry Stacy, I know nothing about soaking & sprouting. 🙁 You could maybe try it with some grains that sprout? I agree with all 6 points that you made, and using apple sauce or bananas is a fantastic idea! I'm going to have to try that with apples…man, that would be good. Maybe apple sauce AND chunks? I agree about the portable thing too, I was thinking this would be nice to take camping with us in summer. And, it reheats very well, so it's great to even make it the night before, and just re-heat it in the microwave in the morning. This sounds delicious! I love the smell of pumpkin and spices baking this time of year, can’t wait to try this. I throw in some ground flax seed for additional texture, and some raisins. Also, because I’m lazy, I don’t chop the pecans, I put them in a plastic bag and pound on them (carefully so as not to pulverize the plastic) with a meat tenderizing mallet. Works like a charm and is much faster and less messy. They keep well in the fridge, so for me it makes a nice week’s worth of breakfast. Thanks for a wonderful & easy recipe! I made this for breakfast today. I love pumpkin and oatmeal. Finally get to have both together. It is good cold.